"That's how one human leaves us" ends the first poem of Dara Wier's direct and powerful new collection, a raw and fluid exploration of grief. Wier records her thoughts with intelligence, clarity, honesty, and immediacy, showing us the unraveling of her world and her new consciousness after a great loss. Dara Wier is the author of numerous collections of poetry, including You Good Thing, Selected Poems, Remnants of Hannah, Reverse Rapture, Hat On a Pond, and Voyages in English. Also among her works are the limited editions (X In Fix) in Rain Taxi's Brainstorm Series, Fly on the Wall, and The Lost Epic, co-written with James Tate. She teaches workshops and form and theory seminars and directs the MFA program for poets and writers at the University of Massachusetts Amherst and co-directs the University of Massachusetts' Juniper Initiative for Literary Arts and Action. She is the co-founder of Factory Hollow Press in North Amherst, Massachusetts. 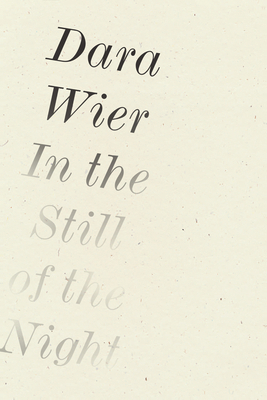 Dara Wier is the author of numerous collections of poetry, including You Good Thing (Wave Books, 2013), Selected Poems (Wave Books, 2009), Remnants of Hannah (Wave Books, 2006), Reverse Rapture (Verse Press, 2005, 2006 SFSU Poetry Center Book Award), Hat On a Pond (Verse Press, 2002), and Voyages in English, (Carnegie Mellon, 2001). Also among her works are the limited editions (X In Fix) in Rain Taxi's Brainstorm Series, Fly on the Wall (Oat City Press), and The Lost Epic, co-written with James Tate (Waiting for Godot Books, 1999). Her poetry has been supported by fellowships and awards from the Guggenheim Foundation, the National Endowment for the Arts, the Massachusetts Cultural Council, and the American Poetry Review. She teaches workshops and form and theory seminars and directs the MFA program for poets and writers at the University of Massachusetts Amherst and co-directs the University of Massachusetts' Juniper Initiative for Literary Arts and Action. Each June she teaches a poetry workshop for the Juniper Summer Institute. Her editing work includes publishing limited edition chapbooks and broadsides with Factory Hollow Press, North Amherst, Massachusetts, a small independent press she co-founded with Emily Pettit and Guy Pettit.